There are many people who claim to have found God, who are "saved", redeemed or who have been baptized. There are those who have confessed their sins and received their penance. Many have prayed for forgiveness and found peace. But how many people have been changed at depth by their religion and who truly practice its teachings? 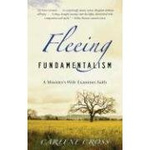 How many Christians follow the teachings of Jesus? There are professed Christians who kneel in prayer on Sunday at church and then cheat on their husband or wife. There are "born again" Christians who spread messages of hatred and intolerance. There is much hypocrisy on the part of followers of all religions. Is it because we are incapable of staying true to these ideals? I don't think so. Jesus showed us that it is possible. Jesus even boiled the Ten Commandments down into just one; the most important one of all, he said, was to love others and to love ourselves. Simple, straight-forward and with no "but" on the end. And yet, it is probably the hardest commandment of all to follow. We can find many excuses not to love some of the people that show up in our lives. There are those people we feel have wronged us personally in some way or who commit horrible acts in the world. It is easy to say that they do not deserve love. But can we be like Jesus and choose to see that which is within them that is holy, sacred and divine? Jesus could see the soul of each person and regardless of the life they had led, know that they were capable of something greater. If we could only look at someone and see the "Christ" within, to see beyond what they have done to who they are at the depths of their soul--then that is love. Today, if you encounter someone that you find it difficult to love, be willing to see the spark of the divine that dwells within that person. They may not know that it is there but by you acknowledging it, maybe someday they will too. And don't forget to see that same goodness within yourself. For some people, it is harder to see that "Christ" spirit within themselves than it is to see it in others. How do you see it? 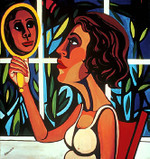 Stand before a mirror for five minutes and look into your own eyes. There will be a soul looking back at you that you may not recognize. It is the real you--a holy child of the Universe. Yesterday, the House of Representatives passed the Hate Crimes Prevention Act. It is designed to protect gays, lesbians, bisexual and transgender individuals--as well as individuals with disabilities--from discrimination and hate crimes. This act had enormous support from the public, law enforcement and religious groups, yet President Bush has threatened to veto it. Why? Because the religious right feels that this act is a threat to their religion. It's hard to imagine that Christians would want to veto a bill with the aim of protecting fellow citizens against violent crimes of hatred. Jesus himself spoke against hatred and bigotry. He stood up for those that were persecuted and condemned by society. He said, "Let he who be without sin cast the first stone." I remember the day that I heard about the death of Matthew Shepard, the young gay man who was brutally tortured and murdered in Laramie, Wyoming back in 1998. I was shocked by this outrageous crime of violence and hatred. Hatred is poisonous. It is like a venom that spreads and becomes the justification for violence and murder against religious groups, races, and anyone who is different. The elderly, homeless, and those with disabilities have been targets. We have seen the effects of hatred and bigotry in Nazi Germany, Rwanda, Bosnia, Darfur and other countries. It seems strange that an act needs to be passed to protect people from crimes of hatred, but unfortunately it appears necessary. 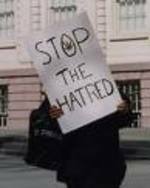 I encourage you to contact President Bush and express your support of the Hate Crimes Prevention Act. You can either contact the Whitehouse by phone at 202-456-1111 and leave your comments, or by email at [email protected]. When my first husband asked for a divorce, I felt as if my heart had been stomped on. Feelings of rejection, abandonment, anger, sadness, and confusion were some of the emotions that I experienced. Going through that divorce was what I would call a crucifixion experience. We've all had crucifixion experiences, if we've lived long enough. They are the challenges that come into our lives--the crises, trials and tribulations. During this Holy Week, we Christians celebrate Easter. It is a time of Passion Plays, Easter lilies, and the Easter Bunny. All the people that don't go to church the rest of the year (except maybe Christmas) come out and fill up the churches. There are some churches that focus mainly on the crucifixion of Jesus--his pain and suffering on the cross. But to do so misses the incredible message of hope and new life that Jesus provided for the world and each of us personally. Jesus had to go through the crucifixion to have a resurrection and to teach us that death has no power over us. His message through the resurrection is also that we can overcome our challenges and be transformed through them. My divorce forced me to call upon my inner strength and resilience. I had to go out and find a job and begin a new life. Through this experience, I eventually learned that I was a capable person and my confidence grew. And, when I was ready, my soulmate appeared and we later married. When Jesus met with his disciples in his last moments, he said to them, "The Father will send a comforter in my name." The actual translated word that was used was "paraclete", not comforter, and it means "knowledge of God inside of you". What Jesus was trying to tell us is that we are never alone--that we have God inside of us--or divine energy, whatever you care to call it. His message wasn't just for his disciples, but for us as well. And it wasn't the first time that he spoke of the indwelling presence. He often referred to the "kingdom of God" and "the kingdom of heaven" being within us. At any moment in our lives, we can have a resurrection experience by focusing on that power and presence within us that is the living Christ. The apostle Paul spoke of this when he said, "Christ in you, your hope of glory." It is by awakening to and identifying with this Christ within that we are transformed and resurrected. As Paul said, "be transformed by the renewing of your minds." On Easter, let us celebrate the resurrection of Jesus. But let us also celebrate our own resurrections and give thanks for the power and the glory of God--through the Christ within us--that strengthens and uplifts us. The Christ within gives us the ability to resurrect and transform our lives at any moment. In my series on world religions, we have covered: Islam, Jainism, Judaism, Hinduism, Buddhism, and Zoroastrianism. Today we will look at the Baha'i Faith, which is really about the oneness of all faiths and the unity of all people. "The earth is but one country and mankind its citizens," said Baha'u'llah, the founder of Baha'i (1817-1892). Baha'u'llah (whose name in Arabic means "Glory to God") taught that God revealed Himself to humanity throughout history, in accordance with humanity's level of spiritual maturity, via successive divinely inspired Messengers. Those Messengers have included: Abraham, Buddha, Jesus, Krishna, Moses, Muhammad, Zoroaster, The Bab (the forerunner to Baha'u'llah who preached love and compassion), and Baha'u'llah himself--all of whom brought the word of the one true God. The oneness of God, the unity of religions and the inherent equality of the races and sexes are part of the central teachings and they are seen by Baha'is as crucial to achieve lasting world peace. Social laws call for the elimination of extremes of wealth and poverty, the need for universal education, and the recognition of the fundamental harmony of between science and religion. Laws directed at personal conduct uphold the necessity of chastity, monogomy, daily obligatory prayer and an annual period of fasting. The Baha'i Faith has no clergy or ritualism. The administration of the Baha'i community is carried out by elected bodies at local, regional, national and international levels. Baha'is are enjoined to achieve a better understanding of the Word of God through a process of individual investigation, study, daily prayer and meditation. Baha'i is one of the fastest growing of the world's religions. During its 158-year history, it has grown from an obscure movement in the Middle East (what is now Iran) to become the world's most geographically widespread religion after Christianity. There are over five million Baha'is in over 130,000 localities worldwide and more than 140,000 Baha'is live in the United States. As part of our look at world religions, today we will look at Judaism. I have often thought it funny that there are people who think Jesus was a Christian. (And, even more ridiculous are people that think that God is Christian.) Jesus was a Jew. The roots of Christianity are in Judaism. 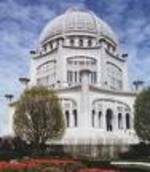 There is an excellent Internet site on Judaism called "Judaism 101"at http://www.jewfaq.org/index.htm . I have used this as a reference. I recommend it for further study. The word of the prophets are true. Moses was the greastest of the prophets. The written Torah (first five books of the Bible), and oral Torah (teachings now found in the Talmud and other writings) were given to Moses. The dead will be resurrected. In Judaism, actions are more important than beliefs. Relationships are the focus--the relationship between God and the Jewish people, between the Jewish people and the land of Israel, and between human beings. The scriptures specify the mutual obligations created by these relationships, although not everyone agrees on the nature of these obligations. The Jewish religion is rich with tradition, ritual and ceremony. In all, there are about 14 million Jews in the world, of whom more than six million live in the United States. Between 1939 and 1945, approximately six million Jews were murdered in the Nazi Holocaust. 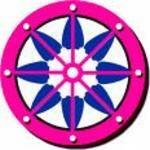 The outer ring of the wheel stands for harmony and unity. The wheel, like life, is always in motion. Buddhism proclaims the dignity and worth of each living being, respect and compassion for all life, and the need for all people to find their own path to enlightenment and to an understanding of the nature of life. Simply put, its basic teachings are: first, to do no harm to any living beings; second, to do good; and third, to purify the mind. Siddhartha Gautama, born of a king and queen in what is now called Nepal, is the founder of Buddhism. Despite being raised in luxury, he left his father's palace at the age of 29 to seek truth and enlightenment. At the age of 35, he was proclaimed the Buddha, the Awakened One. Buddhists do not consider Gautama a god, but rather a great teacher who spent the last 45 years of his life traveling northern India, sharing his message with humankind. That message spread to China, Tibet, Mongolia, Japan, and eventually around the world. There are 252,000,000 Buddhists in the world and between four and five million Buddhists live in the United States. In an age of idol worship and polytheism, the prophet Zarathushtra, or Zoraster, preached the first monotheistic religion of the one supreme God, Ahura Mazda ("Wise Lord"). He preached on the steppes of Asia, the ancient Persia, around 1800 B.C.E. The faith flourished through the rise and fall of many civilizations. 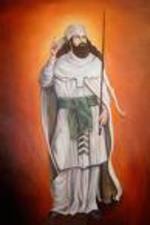 Zoroastrianism became the state religion of the Great Persian Empire, founded by Cyrus the Great in 558 B.C.E. With the advent of Islam and the conquest of Persia by the Arabs, large numbers of devout followers left Persia and landed on the western shores of India where they were given refuge by the native Hindu ruler. Their descendents, the Parsees--concentrated in and around Bombay--have kept the faith alive in India. The principles of Zorastrianism are simple: belief in one God and making the choice of the righteous path (or Asha). The pursuit of Asha offers comforting prospects for the afterlife, however, the main focus of the teachings are the improvement in the quality of life on earth. Moral purity of thought, word and deeds are the the cornerstone of the religion. The ideal for humankind is to be god-like like Ahura Mazda (now you know where the car company got its name). With the cultivation of the good mind, by following the path of righteousness, and with devotion, humankind can eradicate all evil. They can then hope to attain the twin rewards of perfection and immortality and can attain communion with Ahura Mazda. Zoroastrians believe that in every single human being there dwells the divine essence of God, represented by this symbol, which is similar to the symbol adopted by the Unity movement. There are approximately 200,000-250,000 Zoroastrians in the world today, of which about 20,000 reside in the United States. There are 22 million Sikhs in the world and 500,000 in the United States, and yet many people have not heard of this religion. The word "sikh" comes from the Punjabi verb "sikhna," which means "to learn." 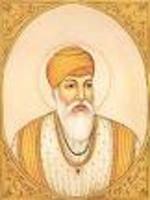 A Sikh, therefore, is a learner, one who learns by following the path of liberation taught by the founder of Sikhism, Guru Nanak, and his nine successors who lived in the Punjab region of India between 1469 and 1708 C.E. According to the Sikh teachings, there is only one God. Waheguru or "Wonderful Lord" is the popular name used for God. This name means "praise to the Guru!" Guru is Sanskrit for "teacher" and refers foremost to God. Secondly, Guru refers to ten human teachers who are equally revered as messengers of God. In Sikhism, the fatherhood of God is preached and the unity of mankind. A Sikh's goal is to attain release from the cycle of death and rebirth of reincarnation and achieve union with God. This is done through meditation, prayer, service to humankind, charity, honesty and by avoiding the five vices: lust, anger, greed, attachment and ego. The mistreatment of women has been protested by the Sikhs in India as well as the caste system. Initiated Sikhs wear the following as external symbols: kara (a steel bracelt), kesh (uncut hair), kirpan (sword), kangha (a comb), and kachha (a special type of short pants). Also, Sikhs wear colorful turbans. Sikhs do not believe in conversion. Hindus are instructed to be good Hindus and Muslims to be good Muslims. Sikhs have endured hardship, persecution and martyrdom as a result of their religious beliefs, social advocacy and unique appearance.